April Hurd has been so helpful in getting me new accounts. Both times its been a pleasure working with her. Looking forward to the next time. Thanks April. Dear megavending Management, We have recently had the pleasure in dealing with Ms. April Hurd / megavending Sales Associate. April was extremely helpful with this process. She understood our requirements and easily guided us Through set up. Thereafter, professional vendors promptly contacted us and presented us proposals. They too were responsive and flexible. Whole process was less than 1 week. I would strongly suggest megavending services for anyone looking to fulfill their needs. Wonderful wonderful! !Not only was the product delivered in 30 minutes flat, they helped move out our old machine that our past vendor has not moved. So professional and extremely exceptional service!!! Gini helped us secure a reliable and reputable vendor in no time, we are so pleased with the level of service she provided. ...within 3 days i am delivering a machine to a new account. Hi - Just wanted to say Gini Sweet helped me at just the right time; i had lost a couple of vending accounts i had, and was losing money, when i received an e-mail from Gini telling me she had a location for me. I went and spoke with the contact person and within 3 days i am delivering a machine to a new account. Thank You Gini! I appreciate it very much. Thank you megavending for making what I thought would be a long difficult process, so EASY! After I explained to Gini S. what my company was looking for-she did all the work. She made the calls and contacted several vendors that would fit my needs. They called me - all I did was decide between them. megavending is definatly the way to go to supply any of your vending needs. Thank you Gini-You're the best. I received a location notification from megavending, and found it very interesting. I contacted Gini and she helped me through the entire process, and I was awarded the location. As it turned out the securing of the location took longer then anticipated, and was more troublesome then expected. Gini stood by me the whole way and was in constant contact with me. With her help I was able to get the location and complete the installation of the machines. I am very much looking forward to working with Gini and securing more locations. My appreciation to Gini and everyone at megavending. ...a location with the amount of people I asked for! They helped by giving a location with the amount of people I asked for! i would recommend them to anyone looking for leads in location for vending machines! Stacy Sweet made a sweet transaction and great deal for me with seller. He saved my life because I need a machine for a high traffic location and I would have lost it if it wasn't for usedvending.com, Thanks again Stacy. I worked with Stacy at 4VendingTips.com and he was extremely helpful and followed up with me every step of the way! I got set up with my new vending company quickly and easily! Thanks for all your help Stacy, I will definitely recommend your services to anyone that I hear is looking for a vending service. I have been with megavending for countless years. I just recently worked with Stacy there and he performed like a champ. The location he found was quite unreasonable, however patience and determination won out. They must have a top of line trainng facility there at Mega, everyone is so nice and they really know you once they interact with you. You are not a person with a wallet, they treat you like family and work hard to make sure you are completely satisfied, not only with locations but also equipment! Good Company, Great people, superior knowledge, that's what gets the job done! Stacy Sweet is the man! He's a real stand up guy. He helped me to get the right location to increase my profits. He was always open and honest with me and provided me with valuable info that lead me to secure my location. I can't wait to secure my next location via megavending and honest hard working people like Mr Stacy Sweet! Please keep the leads coming thanks for everything. Wow! Stacy, you & your colleagues at 4 Mega have done it again! The new account that you referred me to is awesome! It's amazing how easy you make it for me, you do all of the locating work and I just meet and shake hands with the contact & roll in with my machines! What a winning combination! I look forward to conducting lots of business with you! Thank you! I would like to thank Stacy Sweet and his staff for their professionalism and and timely help in securely a vendor for our business. I was unable to get anyone to supply us with a snack / pop machine.I had all but given up when I came across megavending.com. I was contacted within 1 hour of submitting my request or information. Stacy was able to secure us a vendor and our snack machine was installed 5 days later. Now that's customer service!! Kudos to Stacy and his staff. I will be recommending his service to the surounding businesses in my area. I would like to thank megavending for all the assignments that have come our way in Arizona. They have been a pleasure to work with. They are very professional and dedicated. Each account has been very profitable. Wow! Vanessa, you & your colleagues at 4 Mega have done it again! The new account that you referred me to is awesome! It's amazing how easy you make it for me, you do all of the locating work and I just meet and shake hands with the contact & roll in with my machines! What a winning combination! I appreciate you, Vanessa, and your co-workers at megavending.com, and I look forward to conducting lots of business with you! Thank you! Hey there! Just wanted to say thanks for being such professionals on the phone & behind the scene! Vanessa did such an awesome job in securing an account for us here in Dallas & the set up and transaction was 100% seamless! Thanks so much & we're looking forward to purchasing more locations through Vanessa and megavending! I would like to thank Vanessa for all her efforts and due diligence in seeking out a quality vendor for our company. 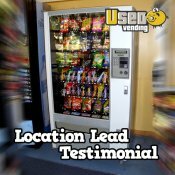 I have had no success on my own locating vending company's that can support our small company needs. I was at a point of giving up when I found and contacted megavending. My search was over. Vanessa took over and began searching for me. Vanessa was always their for me explaining the process and working very hard to find vendors. The calls came in. It was great. My labor intensive project just became easy. Due to Vanessa, I believe I have found an excellent, quality, vendor. I am excited about our choice. Vanessa made my search very easy, smooth and pleasant. I just cannot say enough about Vanessa. My experience has been exceptional. I have dealt with many companies and many individuals during my career and Vanessa knows what customer service means. I highly recommend megavending to anyone who is looking for assistance in locating vending services. Connie and megavending has referred us to several account of which are great locations. They are professional and very helpful in securing the right type of accounts. I am not privy of the vending industry and didn't know where to begin. megavending, in particular, Ms. Melanie Lee, made the task effortless. She found and screened the vendors, and provided them with the particulars about my office. All I had to do was meet and make my selection. Melanie, we couldn't have done it without you. 4-megavending is great! I had the pleasure of working with Melanie Lee. She helped me find a wonderful Vendor who was matched perfectly with the needs of my company. I will definitely use 4-megavending in the future and will definitely recommend it to my friends. I recently became aware of megavending, I am a small vending operator. my contact there is Ms. Melanie Lee, who has been very helpful,not pushy, no hade sell, only the help that you request and need. Thanks Melanie for the help in finding locations. megavending has a professional customer service staff and fair pricing for locations. I definitely recommend megavending service. I have only been using megavending for a few weeks now and can tell you so far that they are always prompt with their response times. Melanie has also given me good leads which I am currently following up on as I write this! Thanks so much! What a great and smooth experience. megavending alerted me to a location needing a vending machine. They provided the location my information. In just a few days I had secured the location. megavending sold me a new machine for the location. The price was right. The service provided from the megavending reps was excellent. megavending.com is a wonderful idea! It's difficult to find vending services that want to deal with a company like ours but this search site hooked me up with a wonderful vendor (Fox Vending) and I couldn't be happier. Melanie from 4MEGA even checked in with me a few times afterwards to see how things were going. I have been in the vending business for nearly 5 years and only had moderate success until Melanie, at megavending, offered me the perfect location. The location proved to be my most profitable location of all times and I am forever grateful to Melanie for all of her assistance. She is the reason why I have been so successful in the vending business while many others have failed. Wanted to express my gratitude to April for being so helpful over the past year! 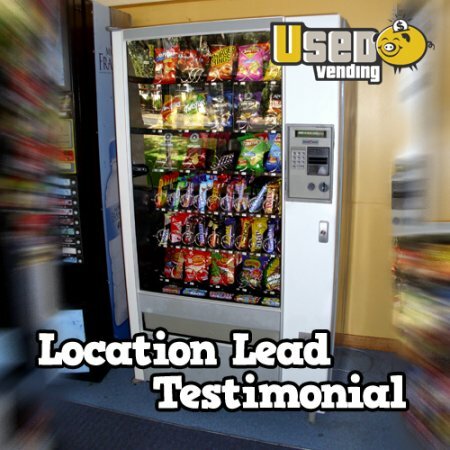 We've bought vending machines from megavending on several occasions, and each time April was friendly and professional, and went WAY above and beyond what she had to in order to make sure we were taken care of. I have been recommending megavending to other vendors I run into online, and will continue to do so...and tell them to ask for April! Keep up the great customer service!